EAST GRANBY, CT – Join former All-Star Guard Ray Allen at the Ray Allen Basketball ProCamp Presented by SunnyD. The camp takes place Saturday, August 6th – Sunday, August 7th, 2016 at East Granby High School, 95 South Main St., East Granby, CT, 06026. For Boys & Girls, Grades 1 to 12. Source: Procamps. 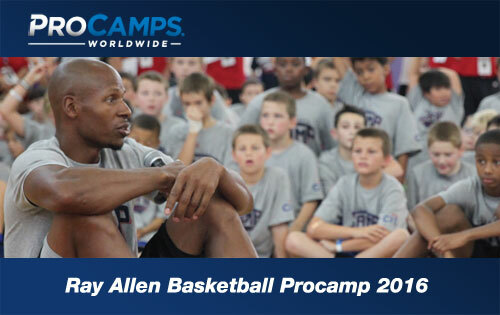 Throughout the two-day camp, Ray Allen and our camp coaches will offer tips and instruction. Campers will experience various stations specializing in fundamental basketball skills and will participate in games and contests. Campers will be placed in small groups by age to ensure that each child gets maximum instruction. Ray Allen is a shooting guard who is currently a free agent. He is a former player for the Miami Heat, the Milwaukee Bucks, Seattle SuperSonics and Boston Celtics. During his Seattle SuperSonics tenure, Allen achieved many individual accomplishments. Allen rejected a two-year, $12 million offer to return to the Boston Celtics and accepted a three-year deal with the Miami Heat, who were limited to their mid-level exception amount of slightly more than $3 million per season. During Allen’s first season with the Miami Heat, he averaged 10.9 points per game and made 88.6% of his free throws while playing an average of 25.8 minutes per game. Sports Speakers 360 is a booking agent for pro athletes. If you would like to book Ray Allen for a speaking engagement, appearance or endorsement, contact a Ray Allen booking agent for fees at 1.855.303.5450.